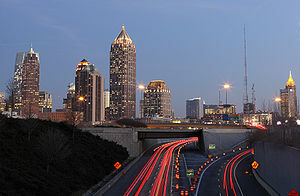 View Atlanta Green Home Sales Reports by clicking the link \"Atlanta Green Home Sales Reports\" above. 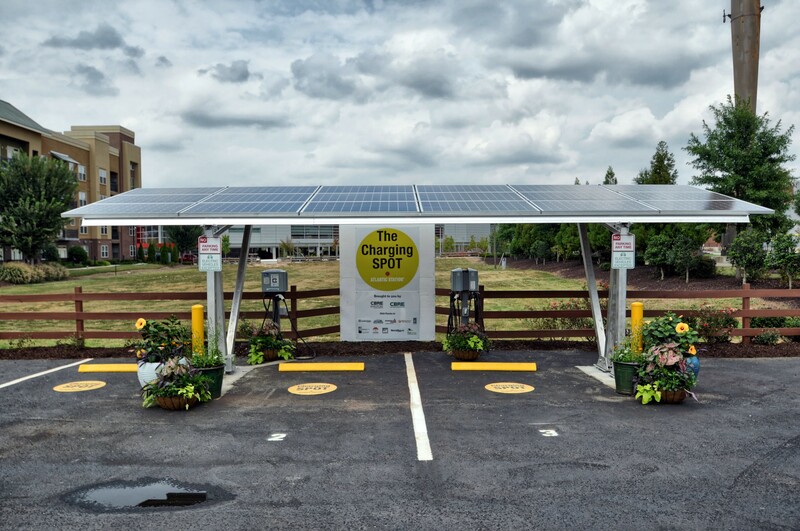 Yesterday, the city of Atlanta introduced the first electric vehicle charging station powered by solar panels above. The station is located near the Millennium Gate in Atlantic Station on 17th Street. 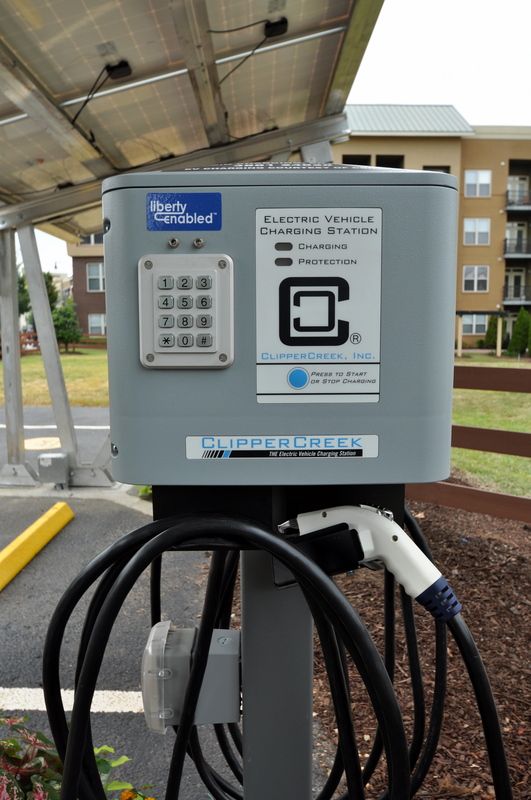 Charging your electric car is free until January 2012 when it will change over to $3.00/hour, or equivalent to filling up with gas at 71 cents/gallon according to a rep from Georgia Power in a Midtown Patch article. Here are some pictures of the station. 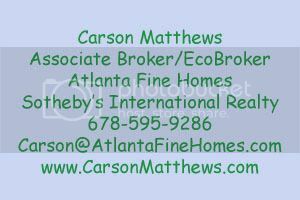 Since beginning the Atlanta Green Home Sales Report in 2008, Atlanta has seen consistent results showing that certified Green Homes (EarthCraft House, ENERGY STAR, LEED for Homes, NAHB Green) sell in less time and closer to asking price. In this report I have combined 2009 and 2010 to see a cumulative view of the data. 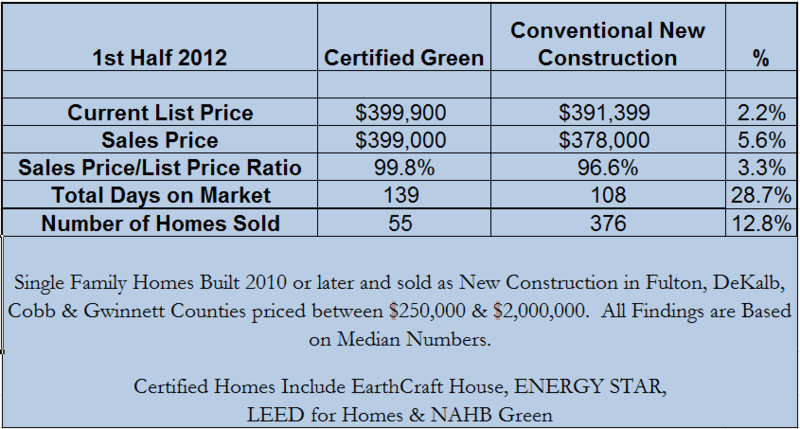 Over the two year period, Green homes accounted for 7.5% of the total new construction homes sold. Those homes sold on average in 104 days (21.2% less time on market) and for 94.9% of list price (3.4% closer to asking price). These are compelling numbers for home builders and consumers alike. Click on the image to view the entire report. Under the Better Buildings Program, approximately $485 million was allocated by DOE through competitive grants to initiatives in the following locations: Austin, TX; 16 towns in Maryland: Berlin, Cambridge, Chestertown, Cumberland, Denton, Easton, Elkton, Frostburg, Oakland, Princess Anne, Dundalk, Westminster, Havre de Grace, Salisbury, Takoma Park, and University Park, MD; Fayette County, PA; Bedford, NY; Berlin, Nashua, and Plymouth, NH; Boulder County, City and County of Denver, Garfield County, and Eagle County, CO; Camden, NJ; Chicago region, IL; Cincinnati, Ohio and northeast Kentucky; Consortium of 14 Connecticut Towns: Bethany, Cheshire, East Haddam, East Hampton, Glastonbury, Lebanon, Mansfield, Portland, Ridgefield, Weston, Westport, Wethersfield, Wilton and Windom; Detroit, Grand Rapids, and southeast MI; Greensboro, NC; Indianapolis and Lafayette, IN; Kansas City, MO; Los Angeles, San Francisco Bay Area, Sacramento, San Diego, and Santa Barbara County; CA; Lowell, MA; Madison, Milwaukee, and Racine, WI; Maine statewide; Missouri statewide; New York statewide; Omaha and Lincoln, NE; Oregon statewide; Philadelphia, PA; Phoenix, AZ; Riley County, KS; San Antonio, TX;; Seattle, and Bainbridge Island, WA; Select Southeastern cities: Atlanta GA, Carrboro NC, Chapel Hill NC, Charlotte, NC, Charleston SC, Charlottesville VA, Decatur GA, Hampton Roads/Virginia Beach VA, Huntsville AL, Jacksonville FL and New Orleans LA; Toledo, OH; and US Virgin Islands. On Monday October 25th, Mayor Kasim Reed launched Atlanta’s Sustainability Week. This week will be full of activities and events across the city of Atlanta. Southeast Green has a great interview with Mandy Mahoney, City of Atlanta Director of Sustainability. You can hear the interview at www.blogtalkradio.com/southeastgreen. Oct. 25 Mayor Kasim Reed launches “Power to Change,” the City of Atlanta’s Sustainability Blueprint, during a press conference at 10:00 a.m. at City Hall, 55 Trinity Ave. SW.
City Hall also hosts “Sustainable Products, Practices, and Places” Vendor Fair featuring local businesses and organizations whose products and services will help city employees integrate more sustainable practices into their daily lives inside City Hall and at home. 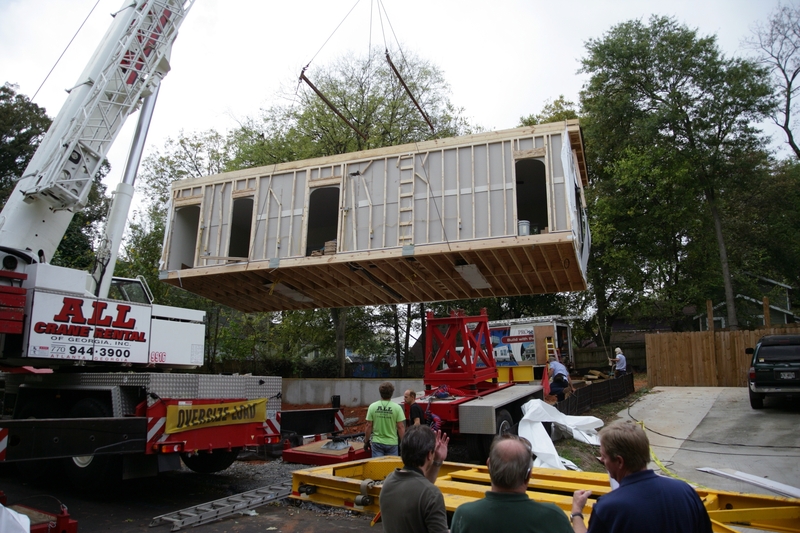 Oct. 26 Mayor Kasim Reed joins Southface officials for the unveiling of the Southeast Weatherization and Energy Efficiency Training (SWEET) Center, 9:30 a.m., Piedmont and North Avenues. More information is available at southface.org. 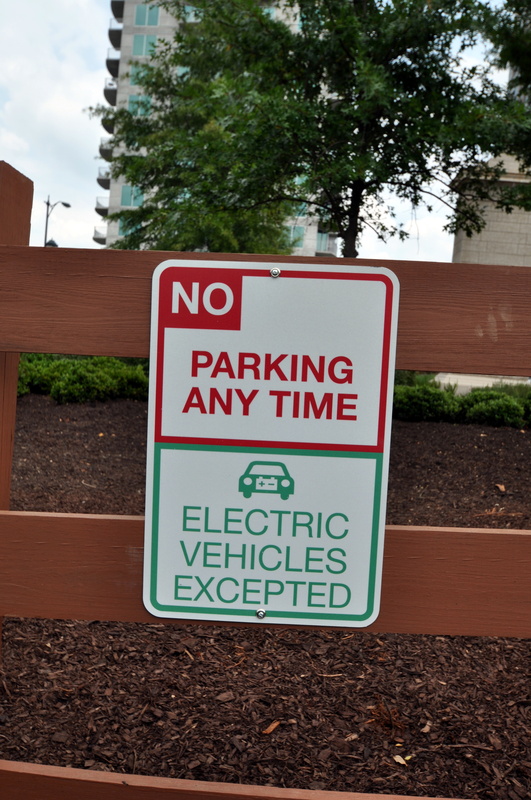 The day also will highlight the city’s green jobs plan, as well as energy efficiency rebate programs that are available to Atlanta city residents. Oct. 27 City Hall will host a Local Food Day, featuring a farmer’s market and “Lunch and Learn” for city employees at 11:00 a.m. The event highlights the city’s effort to bring local food within 10 minutes of 75 percent of Atlanta’s residents by 2020. Oct. 28 City officials will showcase gains in water conservation by illuminating innovations of the Department of Watershed Management at City Hall. 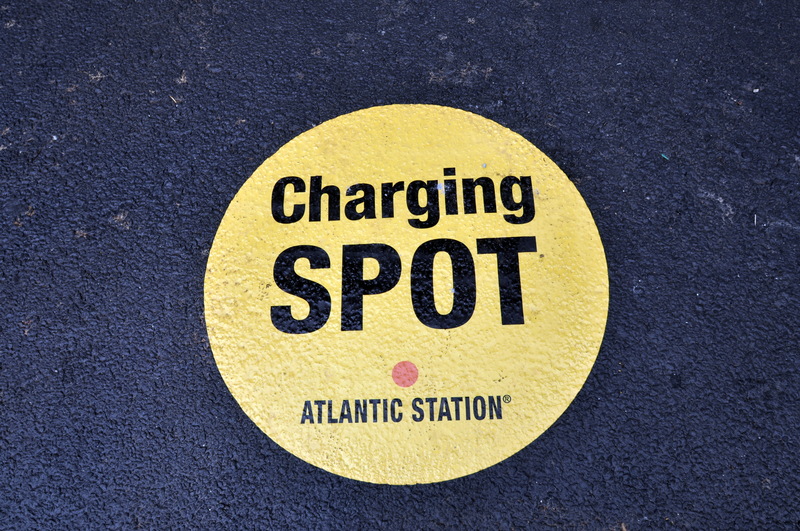 Immediately after, experts from Georgia Tech, Georgia Power, Nissan, and the Atlanta Electric Vehicle Task Force will panel an Electric Vehicle Forum.